The rainwater infiltrates into the ground by occupying the space, the pores or the cracks. His vertical movement breaks off when these space disappear, that is when the rock becomes waterproof. The chalk establishes the basement of a big part of the Haute-Normandie. It is a porous rock (original microscopic cavities between the mineral grains) and cracked (flat microcavities bound to the compression, to the extension or to the cutting tectonics). In depth, the descent of the water in the chalk slows down, then stops. This is due to the progressive closure of the space under the influence of the load lithostatique (the weight of the superior rocks) or in the presence of waterproof lower coats (marls turoniennes or albiennes). A lower saturated zone, in which the space are totally filled with water. If we introduce a vertical cylindrical tube into the rock, the water goes back up generally in this tube until the limit between these two zones. This device is called a piézomètre. He allows to measure the height of the saturated zone. The water contained in this saturated zone is called a tablecloth and a rock which contains is called her the aquifer. The tablecloth of the chalk establishes a resource in essential water of the Haute-Normandie, as in the whole of Paris Basin. The surface water takes care in carbon dioxide in the passage in the steppe black soil and behaves as a low acid. The cracks of the chalk are widened by the dissolution and get organized gradually one networks of big communicating cavities establishing a karst. This karst drains a big part of the tablecloth of the chalk, the one who is most mobile (some tens of cm in some hundreds of m/h) and susceptible to important debits. Real subterranean rivers can form. The water of the tablecloth circulates horizontally and pours outdoors in the low parts of valleys (sources, exsurgences) or throws itself into the alluviums of rivers or still at the foot of cliffs, or on the platier or under the sea. The axis of valleys and of valleuses dry establish preferential drains. The tablecloth of the chalk reloads thanks to the effective precipitation (those who do not return directly to the atmosphere). 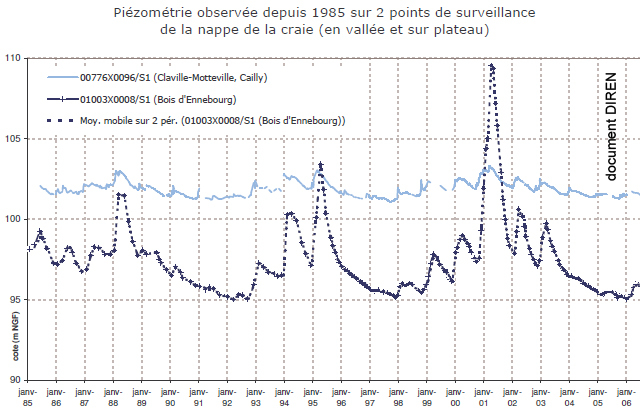 There is a delay between the precipitation (pluviometry) and the refill of the tablecloth (height piézométrique). A period of wintry refill between October and March. The following document shows the refill of the tablecloth of the chalk (more contrasted at the level of trays). We shall find on the site of the D.R.E.A.L. the information updated on the pluviometry and the state of tablecloths.